Most breast cancer cases show a decrease in the concentration of the breast cancer type 1 susceptibility protein (BRCA1). However, only a small portion of these cases have a mutated BRCA1 gene. 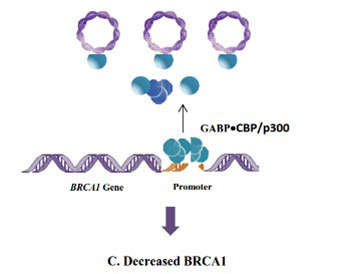 Although many attempts have been made to identify the reason for the decrease in BRCA1 concentration in sporadic, non-heritable breast cancer cases, the cause is still unknown. In this review, we use the Microcompetition Model to explain how certain latent viruses, which are frequently detected in breast cancer tumors, can decrease the expression of the BRCA1 gene and cause the development of breast tumors.